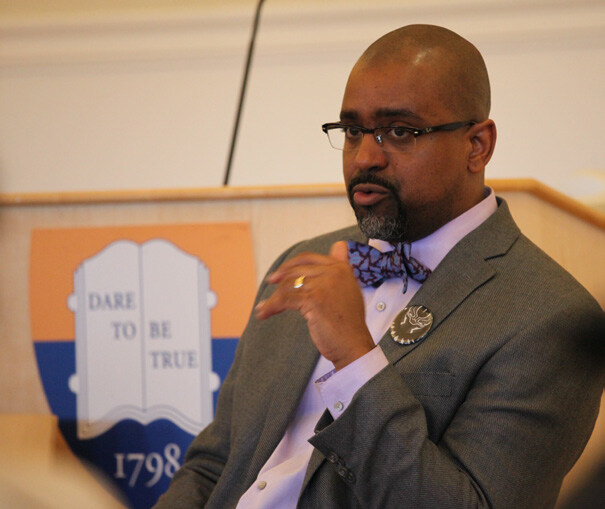 Rahsaan D. Hall, the Racial Justice Program Director for the ACLU of Massachusetts, visited campus as the Onyx Assembly speaker in recognition of Black History Month. Prior to joining the ACLU of Massachusetts, Mr. Hall was the deputy director of the Lawyers’ Committee for Civil Rights and Economic Justice. Mr. Hall also served as an Assistant District Attorney for the Suffolk County District Attorney’s Office. In addition to leading the ACLU of Massachusetts’ Racial Justice Program, Mr. Hall serves on the Massachusetts Legal Assistance Corporation’s board of directors, the Hyams Foundation’s board of trustees, and co-chairs the Boston Bar Association’s Civil Rights and Civil Liberties section. He is also a member of the Massachusetts IOLTA Committee. He is a graduate of Ohio State University (B.A. ), Northeastern University School of Law (J.D.) and Andover Newton Theological School (M.Div.). He is an ordained reverend in the African Methodist Episcopal Church.